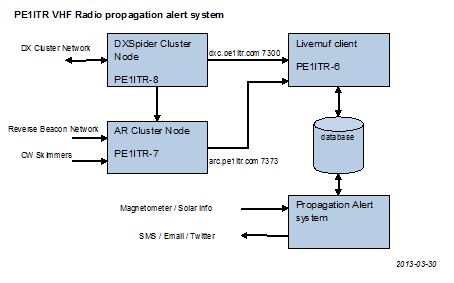 This cluster is part of a radio propagation alert system with some special features alerting users if propagation on VHF and UHF is present. At the moment we alert by email, sms, twitter and paging for E-skip, Multi-hop/F2, Aurora on 50MHz, 70MHz and 144MHz. Tropo alerts only on 144MHz and 432MHz. The propagation alert system is called PE1ITR-6 This system is running LIVE MUF V7 software as engine with a mysql database and addon software. The second part is the PE1ITR-7: AR Cluster server v6. This cluster is not alway active. This cluster node is for our contest station and acts as cluster spot aggregator. Mostly collecting data from cwskimmers.